When the end arrives, how far will you go to save the ones you love?The Critically Acclaimed Darkness Rising Series, Now in One Complete Edition! Darkness Rising is an epic survival/thriller post-apocalyptic series that asks the "what if" question that lurks in the back of everyone's mind.When a terrorist plot results in the detonation of several nuclear devices across the West Coast, the Frasers are thrown into disarray and their strained familial relationships are tested as they watch society collapse around them. Tens of millions of people are killed, injured and driven away from their homes as the result of a sinister plot that the government and its citizens are struggling to understand. With their older daughter lost in the chaos, the Frasers must somehow pull together to support each other and fight to reunite their family.Darkness Rising is a thrilling post-apocalyptic series that follows the survivors of a massive terrorist attack that isn't quite what it seems. As you learn more about the Fraser family and a few brave government agents who are attempting to unravel the horror and mystery behind the attacks, you'll soon discover that not everything in the apocalypse is as it appears to be. 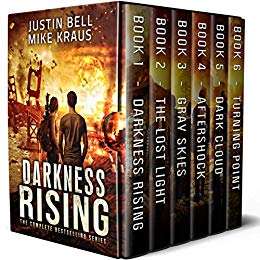 Written as a collaboration between Justin Bell and #1 bestselling post-apocalyptic author Mike Kraus, Darkness Rising is a gripping, unique and timely take on the post-apocalyptic genre, and is one that will leave you breathless with every turn of the page.This complete edition of Darkness Rising features all six books in the series, each one full of action, suspense and drama as the Fraser family struggles to survive the end of days.